We produce high quality mobile crane rope 24×7 non-rotating construction wire rope that can be used in conjunction with mobile cranes. 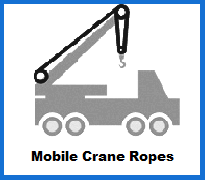 This comes as part of our broader range of crane-appropriate rope products. For mobile crane rope to be effective, it needs to boast a range of important qualities, including rotation resistance, fatigue resilience and anti-corrosion measures. 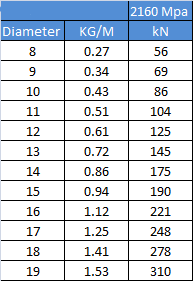 Our 24×7 construction non-rotating mobile crane rope ticks all of these boxes, with minimum breaking loads of between 56kN and 310kN found across diameters of between 8mm and 19mm. Non-rotating rope can help prevent common accidents, keep loads stable and still allow a crane to be used productively, wherever it pulls up. Of course operator vigilance and regular safety checks are the best way to ensure that all wire rope products are used with minimal risk. You can also find 35×7 construction non-rotating wire rope for mobile cranes on our site, allowing you to order the correct rope for the hoisting tasks you have in mind. We also provide compacted rope for dockside cranes that is resilient against crushing, and rope for overhead cranes that has outstanding load bearing potential. Interested in our other Wire Rope Products? Rope Services Direct will give you advice, quotes and in-depth information about the specifications of our offerings when you call or email our team. Our phone number is 01384 78004 and we have a rapid response form on our site for customers who want to email us. 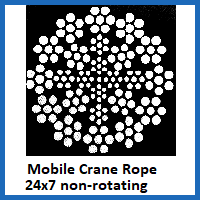 Mobile Crane Rope 24x7 Non-rotating Construction Overall rating: 5 out of 5 based on 6 reviews.